ETC is set to show a host of new and updated products at this year’s Prolight + Sound, with the launch of a new ETC lighting control desk, new software and some very special new ETC lighting fixtures. The Eos Titanium control desk, aka the Eos Ti, takes the place of Eos as the company’s flagship Eos line desk, and is expected to be popular with demonstrations throughout the four day show, with new Eos v2.0 software also available to try. Eos Ti incorporates new hardware and features that make designing and programming even easier. Also on the stand and available for demonstration will be the new 50W ETC Source Four Mini and Source Four LED Studio HD; and the new ES1 dimmer, which brings the same power control and efficiency behind ETC Source Four Dimmer to any other tungsten lamp. 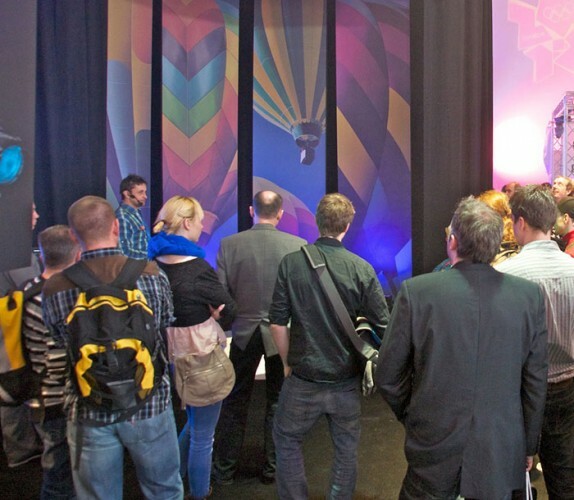 Show stand visitors will also enjoy regular live presentations from ETC’s Layers of Light Theatre, including how to design for today’s hybrid lighting theatres and managing the transition to solid state lighting. A separate presentation discusses how to set up a lighting system for a gig, making use of the new Magic Sheets function on the control desks and RDM technology, and demonstrating how ETC control desks, fixtures and power control products work together. All visitors who attend both presentations and have a one to one demonstration of any of the ETC products on the stand will be entered into a raffle to win a Source Four Mini. Visit ETC in hall 9.0, stand B62 at Prolight + Sound Frankfurt, April 10-13 for more information on these and all its other lighting, control and power control products. In picture: The Layers of Light Theatre at ETC’s stand at Prolight + Sound 2012 proved to be a popular attraction.